PADI Master Instructor, DSAT Tec Deep and Sidemount Instructor, Emergency First Response Instructor Trainer located in Bali, Indonesia. From Discover Scuba Diving to PADI GoPRO Internships, you can learn to dive while on holiday in Bali. 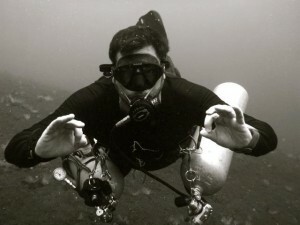 Robert Has experience teaching divers of all ages, from starter to experienced level. Live the dream, dive the world, explore our Ocean Planet one dive at a time... GoPRO or book your next Bali dive holiday with Master Instructor Robert Scales. Mexico still has some interesting and off the beaten path places to discover. We spent a week diving in Mexico this past February, starting with popular Playa Del Carmen dive activities such as exploring the cenotes (caverns and caves) and diving with bull sharks before heading south with Marine-Expeditions to explore the Banco Chinchorro marine park and the area around Mahahual. And if you want to catch a glimpse of how the Mayan Riviera and Costa Maya probably looked more than two decades ago, now’s the time to plan a visit to this interesting corner of Mexico. The region is only likely to get more popular in the coming decade, and the destination risks becoming a victim of its own charm. The diving in Mexico is appealing, and if you keep an open mind and are open to exploring new dive locations, you’ll enjoy the experience. The first two dive days around Mexico were really the best. On day one, Stefan from Reef Marina and Andrea took us to the Chac Mool cenote where we explored two caverns. The water was crystal clear and the photo opportunities just spectacular. On our second day, we had the chance to dive with bull sharks. What a rush! We spent half an hour at depths of about 20 meters (65 feet) as a dozen predators circled us. As the circle of sharks got tighter, our dive group – six divers and two guides – pulled closer together, too. Needless to say, the experience resulted in some amazing shots. By day three of our trip we’d arrived at Banco Chinchorro. And the sandy ocean bottom and nearly unlimited visibility were a welcome change for me since most of my dive experience has been in Asia over the past three years. Surface intervals in the area were fun. We’d stop on a small island within the Chinchorro reserve for a superb lunch of lobster, beans and rice, then set off to explore the island and take photos of the local lizard population. Some of the dives in these parts were so shallow (eight meters/about 26 feet) that we’d be down for a good hour enjoying the sea life. And the only bummer was the hour and a half cramped boat ride together with 16 people (about half of which were snorkelers) to get there. The trips are organized in partnership with local fishermen who use small fiberglass boats powered by twin hundred horsepower engines. The deck area is not completely shaded. So if you plan to do this trip, I really recommend you come prepared with plenty of water, sun protection, a sarong or other sun covering, hat, sunglasses and perhaps even a waterproof music player. Those things will make the journey far more enjoyable. After our time at Chinchorro, our host, Andreas, principal of Marine Expeditions, was keen to show us some additional sites near Mahahual. So we ventured down the coast to explore a few as yet unnamed dive sites and had the chance to weave our ways through canyons covered with healthy sea fans and soft coral. I really enjoyed the dives here, and only wished we’d had better weather and could have spent more time in the area. From the over-crowded shores of Cancun to the famous Blue Hole in Belize, the Mesoamerican Barrier Reef (the second largest coral reef in the world) is a wonderful dive destination for those willing to get off the tourist train and branch out to explore. For great diving around Playa del Carmen, I really recommend divers connect with Stefan at Reef Marina. 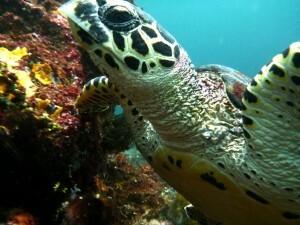 And if you wish to take a trip down the Costa Maya, you can reach Andreas at Marine-Expeditions.com. Both operations and destinations offer very unique experiences for divers looking to explore Mexico’s beautiful Quintana Roo region. PADI Master Instructor Robert Scales (#209468) is a DSAT Tec Deep and Sidemount Instructor, Emergency First Response Instructor Trainer and PADI Specialty Instructor. Robert is an avid photographer and has been diving for over 20 years. He has been working as a full-time instructor since 2010. He lives in Bali, Indonesia.